The Professional edition provides all the Standard Edition features together with a number of editing and filtering tools. These enable the skilled user to enhance and improve the results of the automatic scan and correct operations. Correction List.The program displays a 'Correction List' that shows the location of individual click corrections. Colour Coded. 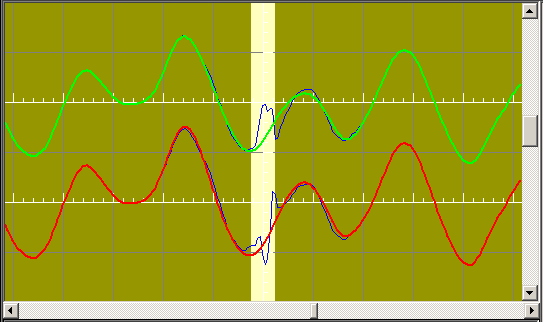 Wave Corrector predicts which clicks will be the most difficult to correct (usually loud repeating clicks caused by scratches) and highlights them in the correction list. Severe clicks are shown in red, moderate ones in yellow. Display Individual Correction. 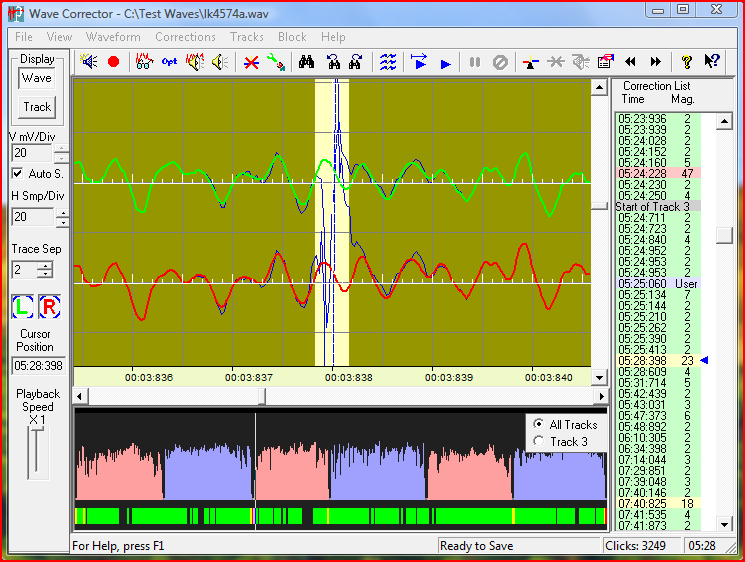 Each correction is displayed in the main window overlaid on the uncorrected wave. Audition Corrections. Selecting the ?Audition? command, you can immediately hear the before and after effect of the individual correction. Adjust Corrections.If a click is still audible after correction you can manually adjust it to match the surrounding wave. Manually Insert and Remove Corrections. 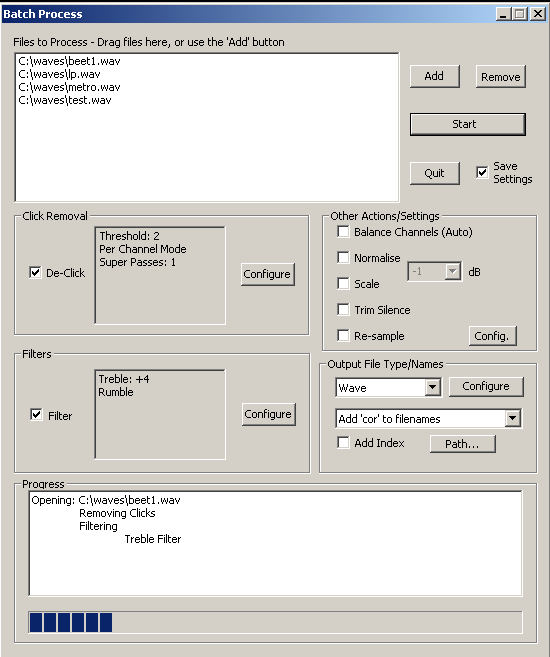 Wave Corrector allows you to remove unwanted corrections and to manually insert new ones, for example when the click detector has missed a click that be removed. By these means, it is possible to attain the maximum fidelity from the original recording. Apply Digital Filters. 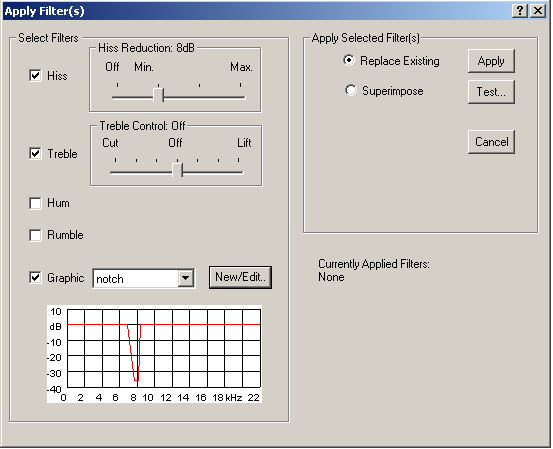 Apply any combination of hiss, hum or rumble filters and/or apply a tonal correction filter to the recorded waveform. The hiss and hum filters use the principle of 'noise subtraction' to remove continuous noise without affecting the frequency response of the recording. Adjust Volume. Normalise the volume of your recording to a user selectable reference level and/or adjust the left/right channel balance. Process Multiple Files. Use the batch processing feature to apply the same sequence of actions to a group of files. Save and Resume an Editing Session. As well as saving audio files, it is also possible to save 'session files' which store the list of corrections (including user edits) for later retrieval. Thus, you can break off from auditioning/editing Wave Corrector's results; save the session file; and resume at a later time. Cut and Splice. This powerful technique allows you to silently remove an unwanted section of a wave. This could be, for example, a cough by a member of the audience during a live recording; or an unwanted announcement during a radio broadcast. Hear an example.